"The star streams that have been mapped so far are like creeks compared to the giant river of stars we predict will be observed eventually," says Marion Dierickx of the Harvard-Smithsonian Center for Astrophysics (CfA). 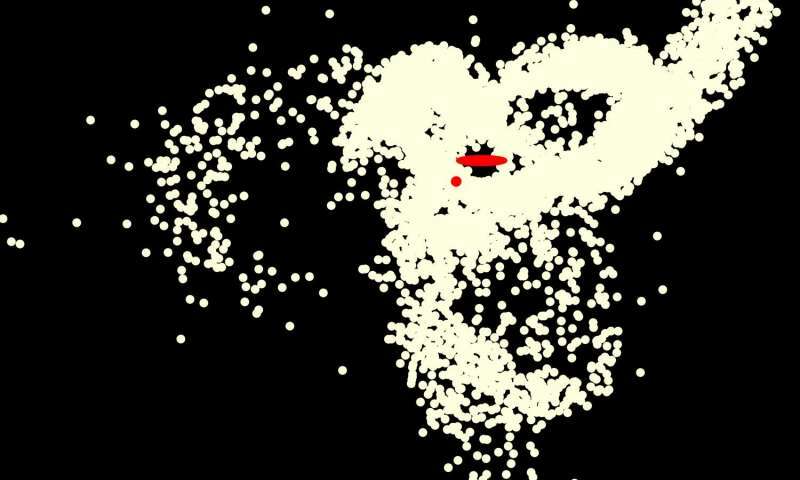 In the computer-generated image below, a red oval marks the disk of our Milky Way galaxy and a red dot shows the location of the Sagittarius dwarf galaxy. The yellow circles represent stars that have been ripped from the Sagittarius dwarf and flung far across space. Five of the 11 farthest known stars in our galaxy were probably stolen this way. Lead author Dierickx and Harvard theorist Avi Loeb, used computer models to simulate the movements of the Sagittarius dwarf over the past 8 billion years. They varied its initial velocity and angle of approach to the Milky Way to determine what best matched current observations.